First a little history. The Catskills are a mountainous region of southeastern New York State. 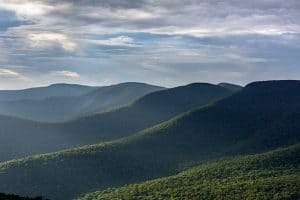 The Catskills region, which is comprised of Sullivan, Ulster, Greene and Delaware counties, is known for its crisp mountain air and fresh food, and has traditionally served as a year-round resort destination of choice for New York residents. 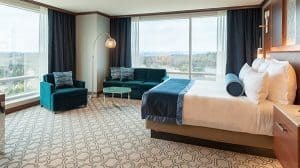 Whether it is the lure of winning a mega fortune or just finding precious time away, still one of the top escapes to experience such delights is in the Catskills at the newer Resorts World Casino Catskills in Monticello, NY. I chose this getaway for its location less than 100 miles from New York City and an ideal jumping off point to explore the beautiful Catskills Mountains. Opened in February 2018, the modern glass structure includes an 18-story casino, hotel and entertainment complex with approximately 100,000 square feet of casino floor, over 100 table games, 2,150 state of the art slot machines, a poker room and private gaming salons. Guest Room at the resort. Guest amenities include 332 all-suite luxury rooms, which include 12 penthouse suites, 8 garden suites and 7 two-story villas, two indoor pools, a spa and fitness center — all designed to meet 5-star and 5-diamond standards. Guests will be able to choose from over 10 varied bar and restaurant experiences, including fine dining, and an Italian steakhouse created by celebrity chef Scott Conant. Guests can also enjoy year-round live entertainment at the over 2,000-seat event center, casino bars, restaurants and lounges. Another dining option at the resort. In the casino, I enjoyed dining at Cellaio with its wonderfully inspired Italian cuisine. The dining area is quite creative with an open kitchen that allows patrons to view chefs and assistants engaged in cooking preparations. The contemporary design creates a modern atmosphere and the food was truly first class especially my steak which was deliciously prepared and the Italian wine selection is extensive. Our very comfortable, tastefully designed suite at the resort featured views of the Catskills. After a little rest, later in the evening I went to play blackjack and found a table with experienced and novice players from all over the world. I enjoyed the games excitement and left the table losing only a “small” amount of money. I found the modern gaming floor provides great conveniences with built-in charging stations for electronics and cup holders all a part of the contemporary gaming experience. I was amazed at the lightning fast equipment that added to the fun and fast paced action. 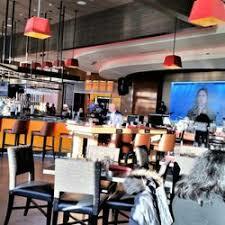 Having dining facilities on the gaming floor enhanced the casino experience too. The setting offered an attractive design and décor that seemed to match players tastes. The intense concentration of some players created an air of excitement and expectation as to what would the next card reveal. Would the red décor bring them good luck? While there were plenty of Western-style casino games, I observed some large salons dedicated to Asian table games, including Baccarat, Pai Gow tiles and Pai Gow poker. In deference to the high rollers, this casino provides hosts who provide VIP services to their special clients. This can include access to private casino chauffeurs and the soon to be offered service of using the property’s future helipad. Premier guests have VIP check-in with their own private gaming salons and private access to penthouses and garden suites. They enjoy privileges that range from the use of the pool with a bar and and exercising in a private fitness center and spa. Personally I used the hotel concierge to inquire and plan visits to regional attractions, outdoor and nature activities near the resort. For different type of relaxed and calming experience, I visited a scenic sanctuary at the YO1 Catskills Wellness Center, which is a few miles away in Monticello. Overlooking Baileys Lake, this retreat’s tranquil setting is the perfect backdrop to practice a comprehensive wellness program that focuses on holistic, natural healing practices through the use of Ayurveda, Yoga, Naturopathy and Acupuncture. This holistic program inspires individuals to seek their own paths to wellness by following a personal itinerary based on a counselor’s recommendations including daily therapies and yoga classes, acupuncture, exercises and customized diets. The goal is to establish habits for a well-balanced and healthy lifestyle that leads to optimal health and well-being. The comprehensive program offers diverse, holistic offerings based on ancient and traditional Indian diet and wellness practices. For the first time, these traditional wellness practices are available thanks to its founder, India’s leading media entrepreneur, Subhash Chandra, who has established YO1 Catskills as his world-class destination center dedicated to health and longevity. Visit the Catskills official site.